Gospel Pass, towards Hay. Silky – smooth surface, wonderful views. Doing it in company with another cyclist made it special. Great Oak Wholefood Cafe, Llanidloes. Friendly service, great meal, free Wifi and battery charging -excellent value. Tie between Riverside Camping at Caernarfon and Blackthorn Farm near Holyhead. Both were very friendly and welcoming and had excellent facilities, including an on site cafe at Riverside and a B&B at Blackthorn, both of which serve breakfast. Beautiful riverside location (providing it’s not in flood) or coastal views (providing it’s not blowing a gale) respectively. Riverside sneaks it with free Wifi. I was always somewhat ambivalent about finishing this trip in Caernarfon or Holyhead. By Caernarfon I would have done all the mountains and reached the sea. What more was needed? Well, Caernarfon doesn’t have the right sort of railway station so I would have had to cycle to Bangor anyway, and my editor encouraged me to finish with a photo of South Stack lighthouse. So what was there to see? Magnificent views of the Menai Straits from the smooth tarmac of the bike path along the old Caernarfon to Bangor railway line. Close-up views of Telford’s wonderful suspension bridge and The Swellies, the tidal rapids between Telford’s bridge and Stephenson’s Brittania bridge. And Llanfair PG. at the end of a tour it was a useful place to pick up the obligatory box of Welsh fudge to take back to work. There’s an old folk tale (which I just made up) that when Duw had finished creating Wales, he had some bits left over. Not enough for a big mountain range or majestic moorland, mostly just the twisty-turny bits of country lanes that wouldn’t fit anywhere else. Being short of time he dumped them down in the sea just a bit away from the mainland. Not quite flat, with surprisingly many steep ups and downs. That’s why the best thing about cycling in Anglesey is the view of the mainland. And what a view it is! From the Carneddau to Bardsey the whole of Snowdonia was stretched out on my left as I pushed my way into the stiff westerly that was trying to keep me from Holyhead. Anglesey does have its own little mountain, and my campsite was halfway up it. This had the advantage that it wasn’t much further to South Stack lighthouse, which really was the end of the road. Time to press-gang a couple from Somerset into taking my photo and admire the views. From the top of the headland one could see the Wicklow mountains. My ID may be RocknTroll, but I don’t often post from beneath bridges. I had heard the storm coming for some time, from the thunder rumbling over Rhobell Fawr to my left. When I saw lightning, I knew it was time to take shelter. There was one more steep stretch to climb before the descent to Trawsfynydd, but I could see the road ahead across open moorland. Seeing a clump of trees beside road I pulled over. On closer inspection there was astream in the trees and the stream ran under the road. There’s almost enough headroom to stand upright and it’s dry apart from under foot. 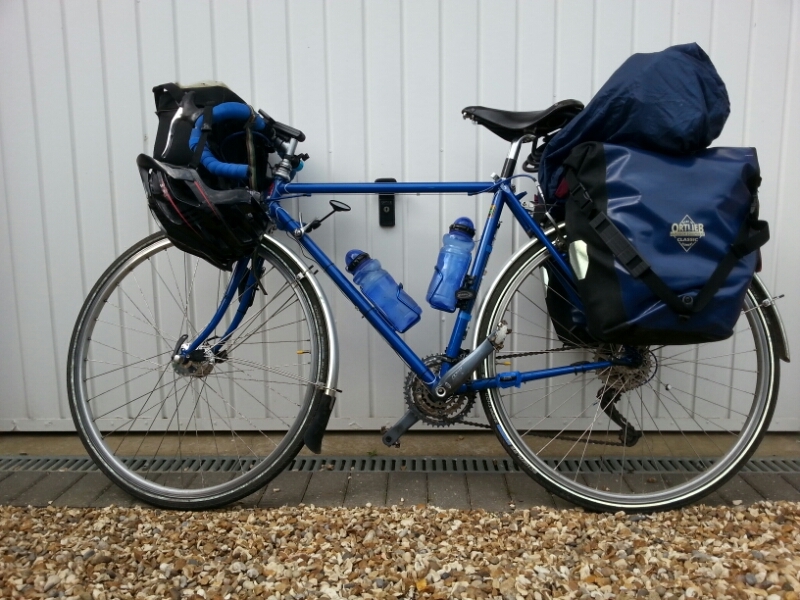 Half an hour and two blogs. I hope it stops soon. 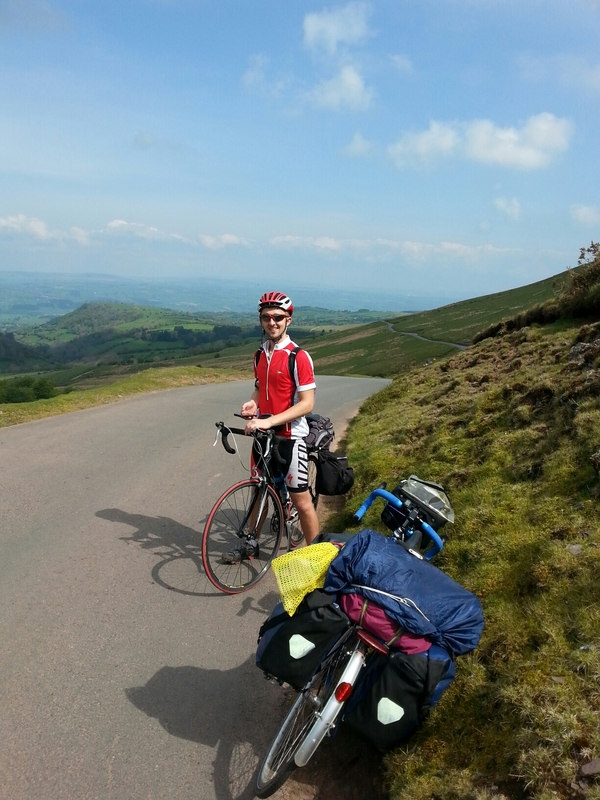 The road from Llanidloes to Machynlleth gets a lot of billing as “The Mountain Road”. Even the road signs say “via narrow mountain road”. As I turned left for Machynlleth just beyond the delightfully-named Staylittle I was amazed by the width. It was here I met Richard and Phyllis. I stopped in a layby to take a photo of the view down the Dylife Gorge. They were parked higher up in the layby. After taking a photo I wandered over and asked if they’d mind taking one with me in it. This led on to an offer of a cup of tea, which I gladly accepted. 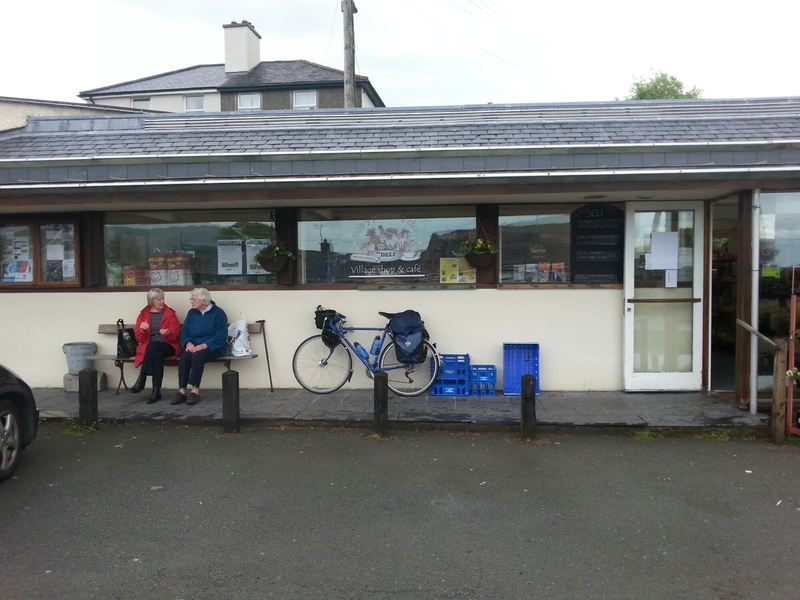 (My first free cup of tea of the trip was from Dot, a resident of the leisure park near Builth). Beyond Dylife there was a road narrows sign, and it did get somewhat narrower, but there was still room for two cars to pass without difficulty. The County Council needs to apply to the EU for funding to upgrade the signs to match the roads. Earlier in the morning I had passed a very old sign, one that said “Unsuitable for Motor Vehicles”. It certainly was. Whereas many farm tracks have two bands of tarmac with a strip of grass down the middle, this had a narrow central band of tarmac and two gullies either side deeper even than Oxfordshire’s potholes. Sustrans followers with vertigo would be advised not to use it. This would have a better claim to be THE Mountain Road, if only it were a road. My average speed for today was 9.3 mph. Yesterday it was 8.4. 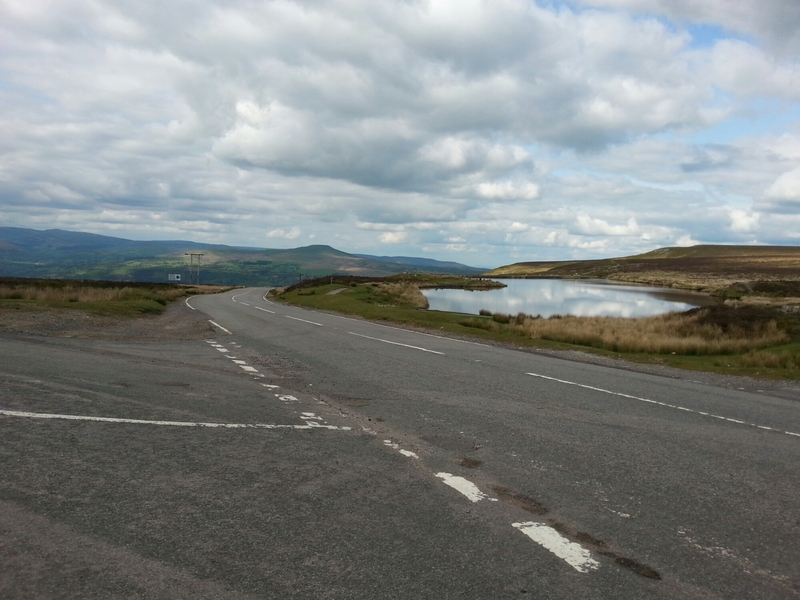 Abergwesyn to Tregaron is THE mountain road.